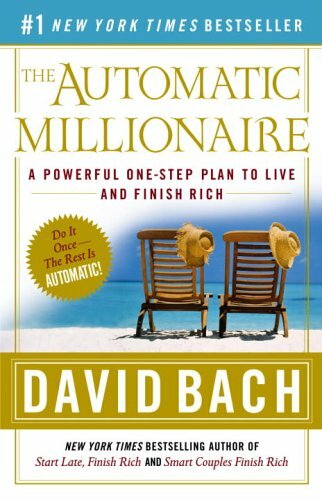 This book had me thinking quite a bit about this concept I read all the time by conservative personal finance writers. The concept I am talking about is investing 10% of your gross income for the long-term and then in 30 years you'll be able to retire will a ton of money. I have even used examples of this showing that if you invested X amount of money you'll end up being a multi-millionaire in 30 years. Perhaps, I wasn't thinking completely clear when I talked about all the great results. The reason Bach had me thinking about this is because he kept talking about the average salary being a little less than $50,000 right now. Well 30 years ago, the average salary was $14,000. Now, your gross pay at $14,000 makes $816.00 a month, and your 10% investment would be $81.00 a month. If you invested $116.00 a month for 30 years at a return of 12% APY you would accumulate $320,000 which is hardly enough to retire on in 2010. Let's say for fun you made twice the average pay in 1980 and brought in $30,000. That would be ton of money in 1980 standards. If you invested 10% of your gross monthly income for 30 years you would accumulate just over $700,000. Nice chunk of change, but hardly enough to last through 15 years or more of retirement by 2010 standards. Right now, having about $5 Million for retirement sounds awesome. But half a million also sounded good in 1980... I feel it is nearly a certainty that you must use other vehicles of investing if you want to cross that threshold between being who you are now and being wealthy. Grinding will not do it. So, where do we go to invest in addition to our 10% or possibly in place of it? Well I think the best option is to start using OPM. That means Other People's Money. The easy was to use OPM is with real estate. If you put in $20,000 as a down payment and land yourself a $200k property and then that property increases in value (while simultaneously producing cashflow) to $220k over the course of 2 years (not all that uncommon) you would realize a 50% return on your money but the property is growing at 5%. That sounds pretty awesome. Other ways to get access to OPM is to either start a business (pretty risky), or buy an existing business (sometimes time intensive and requires more work than real estate). Okay... stepping of my soap box. The fact is that you need to do more with your money then just invest in your average stocks and bonds if you want to accumulate any kind of real wealth. Bach is a great writer and I love his books and his attention to real estate as a vehicle for wealth building. As always, if you have any questions on the book don't hesitate to ask. I would be more than happy to help anyone that wants it.